NETGEAR, a global networking company that delivers innovative products to consumers, businesses and service providers, is expanding its portfolio of cable products for the retail market. This week, the company is launching two new industry-leading Cable Gateways at the 2014 International CES® trade show in Las Vegas, where the company is demonstrating a number of new products to press, customers and channel partners. The new gateways (www.netgear.com/home/products/networking/cable-modems-routers) offer you faster Internet and blazing-fast WiFi in one space-saving device so you can simplify and supercharge your cable Internet connection. With these gateways, you’ll make modem rental fees on your monthly cable bill a thing of the past. The NETGEAR AC1750 WiFi Cable Modem Router Gigabit Ethernet (C6300) (www.netgear.com/c6300) is a powerhouse device combining the fastest Internet cable download speeds available today with the world’s fastest WiFi. It is designed for today’s connected homes with an increasing number of devices to provide superfast HD coverage throughout your home. The C6300 combines a high performance Intel® Puma™ 6 processor to provide the best wired and wireless performance combined with best-in-class 802.11ac WiFi speeds. Its 16×4 CableLabs-certified® DOCSIS 3.0 cable modem supports the fastest Internet cable download speeds available today with download speeds up to 680 Mbps** — up to 16 times faster than previous-generation DOCSIS 2.0 cable modems — with support for 16 download and 4 upload channels simultaneously. NETGEAR combines the powerful DOCSIS 3.0 capabilities of the C6300 with next-generation dual-band AC1750 WiFi (450+1300 Mbps*), which delivers data throughput up to three times faster than 802.11n WiFi. With the C6300, you’ll experience smoother streaming of HD videos, movies and music, more responsive online gaming, and faster file downloads, with the best wireless coverage possible today. The C6300 supports the NETGEAR genie® application, a personal dashboard that makes it easy to install, monitor, control and repair your home network from PCs, Mac®s, and iOS and Android™ smartphones and tablets. 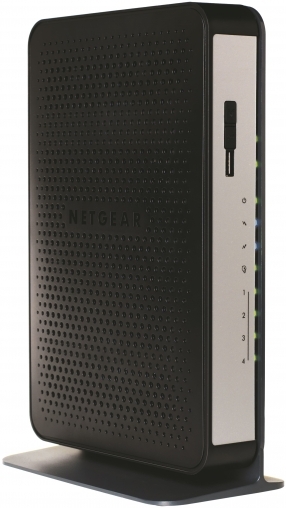 The NETGEAR N450 WiFi Cable Modem Router (www.netgear.com/N450) is a low-cost alternative to the C6300. It has a built-in high-speed 8×4 CableLabs-certified® DOCSIS® 3.0 cable modem that supports download speeds up to 340 Mbps** — up to 8 times faster than DOCSIS® 2.0 — for streaming HD videos, faster downloads, and high-speed online gaming. It supports 8 download and 4 upload channels simultaneously. It also enables 802.11n WiFi networking speeds up to 450 Mbps* (@ 2.4GHz). Like the C6300, it is compatible with current and next-generation WiFi devices and offers advanced Quality of Service (QoS), IPv6 support, and the highest level of wireless security. The NETGEAR N450 WiFi Cable Modem Router is available now from major retailers in stores and online, at an MSRP of $119.99 in the U.S. The AC1750 WiFi Cable Modem Router Gigabit Ethernet (C6300) will become available in the second quarter of 2014, at an MSRP in the U.S. of $219.99. You can read all announcements from NETGEAR at netgear.com/about/press-releases/.